Some Guys Have All the Luck. Not These Guys, Mind You. These guys? They never met a black cat they couldn't cross, a mirror they couldn’t crack. In an earlier piece, we named the “Luckiest Pitching Staff” of all-time — pitchers who compiled gaudy won-loss records despite a mediocre performance on the mound. Jack Coombs, Christy Mathewson, Roxie Lawson… if you find yourself in a lightning storm, these are the guys you want standing next to you. It’s now time to turn our attention to the unluckiest pitching staff of all-time — namely, those seasons where a pitcher’s won-loss record greatly undervalues their performance. There are scores of examples of pitchers who pitched great but saw their season sabotaged by a terrible team. In order to narrow down our choices a bit, we limited this hypothetical rotation to starters who led their league in adjusted ERA (ERA+), which compares a pitcher’s earned run average to the league ERA, adjusting for park effects. If a pitcher compiles an ERA+ of 125, his ERA was 25% better than league average (which is always 100). Because it takes playing conditions into account, ERA+ allows us to compare seasons across the decades (it’s admittedly a blunt instrument — but we used the same basic criteria that helped us determine the “luckiest” staff of all-time, so we’re sticking with it). On to a staff that pitched with the fury of Zeus and the patience of Job. The year he turned 40, Nolan Ryan led the league in ERA (2.76), ERA+ (142), strikeouts (270), K/9 (11.5, a career high), fielding-independent pitching (2.47), which assigns an ERA-type value to a pitcher’s strikeout, walk, and HR-allowed rates, H/9 (6.5) and SO/W (3.10 — the only time Ryan paced the league in this category). He didn’t throw a no-hitter, but by many measures, it was the best season of Ryan’s singular career (on an inning-by-inning basis). How then did he get saddled with the worst winning percentage (.333) of any starter in the league? Well, he was unlucky of course (you did read the headline, didn’t you?). At 76–86, Houston was a mediocre-but-not-truly-terrible team — except when the Ryan Express pulled into the station. The Astros averaged only 3.28 R/G for Ryan, and even that paltry total is somewhat misleading: They mustered two runs or less in 16 of Ryan’s 34 starts. Not even John Wayne in spikes could overcome those odds. “Big Ed” Walsh, HOF right-hander for the Chicago White Sox, was an ornery sort. He wasn’t the type of guy who went in for small talk. If he had a problem with you, you knew it — and you didn’t want a problem with Big Ed. He intimidated opponents and teammates alike (he once threatened to kill his third baseman for misplaying a bunt — ​and his third baseman didn’t think Walsh was speaking figuratively). He was also tougher than glove leather. Joe McGinnity, a stalwart contemporary, might have been known as the “Iron Man” — but Walsh was at least his equal in terms of endurance. In 1908, Walsh started a third of Chicago’s games, winning 40 and pitching 464 innings. Big Ed was even better in 1910, leading the league in ERA (1.27), adjusted ERA (189), WHIP (0.820), SO/W (4.23), and saves (only five, but still). He fashioned seven shutouts, racked up 369.2 innings and generated 10.9 WAR. For his efforts, he was rewarded with an 18–20 record, leading the league in losses (and, one assumes, withering glares at one’s teammates). Coombs was fantastic, and his record reflects his performance. Walsh was better in just about every respect, and lost more often than he won. The most remarkable aspect of Walsh’s season isn’t the 20 losses — it’s the 18 wins he was able to muster toiling for a team that won but 65 games. These faded remnants of the famed 1906 “Hitless Wonders” ranked last in hits, doubles, home runs, average, on-base percentage, slugging percentage, and OPS+ (remarkably, they finished second-to-last in runs scored). One wonders what Walsh had to say to teammate Doc White, who, despite pitching 130 fewer innings with an ERA more than twice as high, somehow fashioned a winning 15–13 record. Bob Gibson? Really? A guy with a .710 winning percentage is unlucky? Bear with us. Just for a second. Gibson, as you know, fashioned one of the most famous pitching seasons in history in 1968. His 1.12 ERA is one of those indelible numbers seared into the collective conscious of every baseball fan, like “56,” “.406,” “61” (it still resonates more than 70 or 73). He was the unanimous pick for the Cy Young award, an overwhelming pick for the MVP award, and pitched the Cardinals to within one game of a World Series title (Gibson set a Series record with 17 strikeouts in Game One, and threw a complete-game 5-hitter in Game Four; he lost Game Seven to Mickey Lolich and the Tigers). How then does this season count among the unluckiest ever? Because Bob Gibson, by all rights, probably should have compiled a 28–3 or 29–2 record in 1968. The Cardinals averaged but 3.03 runs per nine innings for their indomitable ace; they scored two runs or less in 18 of Gibson’s 34 starts. He lost six games in which he pitched at least eight innings and gave up 2 earned runs or less. 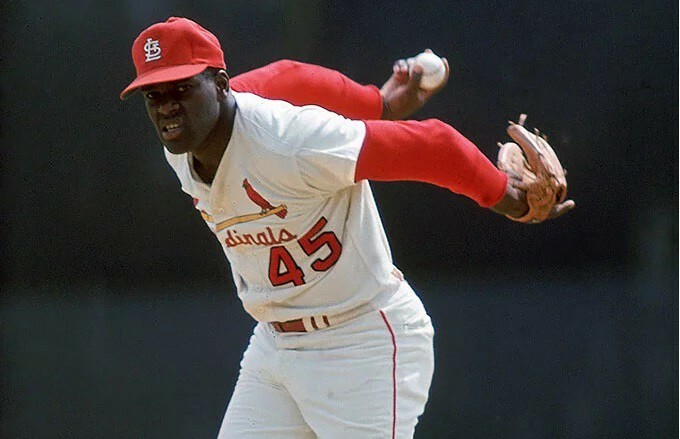 April 10: In his first start of the season, Gibson “allowed” an unearned run on a Lou Brock error. He was lifted after seven innings, with the team trailing 1–0. The Cards rallied for two runs in their final two innings to get the win for reliever Ray Washburn. May 17: Gibson was on the losing end of a superb pitching duel when he surrendered the game-winning hit to Philadelphia’s Bill White with two outs in the 10th inning. Woody Fryman picked up the 1–0 victory with 10 scoreless innings. Sept. 17: Gibson throws eight dominant innings (4 H, 1 ER, 10K), but is on the losing end of another 1–0 decision when Gaylord Perry throws a no-hitter. May 12, Sept. 6, Sept. 22: Gibson loses three games by the score of 3–2. Hey, it happens. But Gibson only surrendered 2 earned runs in each start. In each game, he was bedeviled by his defense (with Dal Maxvill, normally an excellent defensive shortstop, accounting for two of those losses). With shoddy defense behind him and anemic offense supporting him, Gibson needed to be just-about-perfect to win — and more often than not, he was. We stand by our pick: Bob Gibson pitched the unluckiest 22–9 season in history. Two pitchers are available on the free-agent market. You can sign one to your team. Who do you choose? Pitcher A: 23–8, led the league in wins. Pitcher B: 15–15, led the league in losses. It’s pitcher A in a walk. Why are we having this conversation? Pitcher A is a winner. Pitcher B is a loser. Tough choice. How do you differentiate between the two? WAR, ERA, ERA+ rate them as equal. Pitcher A allowed fewer baserunners in a smidge more innings, but Pitcher B more than made up for that by allowing half as many home runs. If pressed, you might point to Pitcher B’s better FIP, but that’s splitting hairs. There’s no wrong choice. ​By now you know that Pitcher A and Pitcher B are the same guy. In both examples, Pitcher A is Orel Hershiser, 1988; Pitcher B is Orel Hershiser, 1989. Why the enormous difference in W-L record? Two reasons: Run support and performance distribution. The Dodgers averaged 3.8 runs/game while Hershiser was on the mound in 1988; that figure dropped to 3.0 in 1989. Unless you’re Bob Gibson, it’s tough to win when your team gives you next to nothing to work with. And, then there’s the matter of performance distribution, which in this case is known as “the Streak.” As of August 30, 1988, “Bulldog’s” record stood at an excellent 18–8, with a nice 2.84 ERA (about 20% better than league average after park effects are taken into account). He then decided to stop giving up runs — literally: Hershiser set a major league record with 59 consecutive scoreless innings — that’s 6+ shutouts in a row — lowering his ERA half a point in the season’s final month. In 1989, there was no such outlier period in performance — he was just consistently excellent. From May 30 through the end of the season, his ERA “fluctuated” between 2.31 and 2.61, while the Dodgers’ offense consistently let him down. Same pitcher, same performance, very different results. By all accounts, Jacob deGrom is good-humored, modest, and acts the consummate professional. He was also the best pitcher on the planet in 2018. So what did he do to tick off his teammates? Oh, they might claim otherwise. But how else to explain the Mets scoring 2.9 runs per game while deGrom was on the mound? How else to explain a bullpen corps that conspired to cough up four leads for the Mets ace? How else to explain how the best pitcher on the planet lost as often as he won? OK, fine. deGrom probably wasn’t the victim of a team-wide grudge. He was, however, the victim of incompetent defense, meager bullpen support and remarkably inept hitting. Those forces conspired to tag deGrom with 13 no-decisions in 32 starts. His era in those games? 1.62. That’s 1.62 over 13 starts and 84.1 innings. And nary a win to be found. For good measure, deGrom’s ERA in his nine losses was a bloated 2.71 — which, if extrapolated over a full season, would have been good for fourth-best in the league. Put another way, Jake deGrom was 0–9 when he dared to pitch as well as the fourth-best pitcher in the league (for comparison’s sake, St. Louis ace Miles Mikolas pitched to a 2.83 ERA in 2018. His record? 18–4). deGrom’s 10–9 record is a startling aberration on an otherwise stunning statistical resume: A league-leading 10.1 WAR; 24 consecutive starts of allowing three runs or less (a MLB record); an ERA more than half a run lower than the next-best in the league. Opponents hit .196/.244/.277 against him. His 1.99 FIP and 216 ERA+ are among the ten best of the Expansion era. deGrom’s 2018 was, in all ways that matter, a season for the ages. What’s an unlucky staff without the unluckiest reliever, ever? After a disastrous 1992 season that ended with 14 consecutive losses, things had to get better for NY Mets pitcher Anthony Young. Young’s 1993 season began the same way his 1992 season ended: With a loss in relief. And another. And… well, you get it. He had a point: As the Daily News reported, Young at one point during the streak converted 12 straight save chances and threw 23.2 straight scoreless innings subbing for then-closer John Franco. Relievers can’t get wins if they don’t blow saves. And very, very bad luck. Jeremy Lehrman is the author of Baseball’s Most Baffling MVP Ballots, the definitive history of the most contentious award in professional sport. [i] It’s true that Young’s adjusted ERA was slightly better than the league average in 1993, but it overstates his value a bit: As a reliever, Young allowed bushels of inherited runners to cross the plate — tallies that were charged to the ledger of the man he replaced on the mound. He really wasn’t as good as his ERA+ might suggest — but he was certainly nowhere near as bad as his 1–16 record would have us believe. No pitcher, other than Charlie Brown, is that bad.